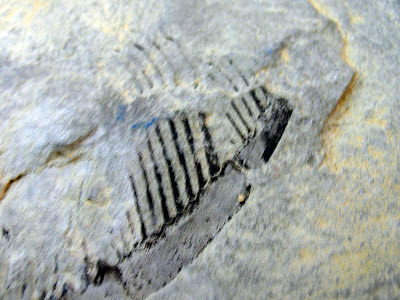 On KYANA Geological Society's last trip to the Cincinnati Museum Geier Collection Center, one of our members Bill donated part of a fossilized eurypterid (sea scorpion). 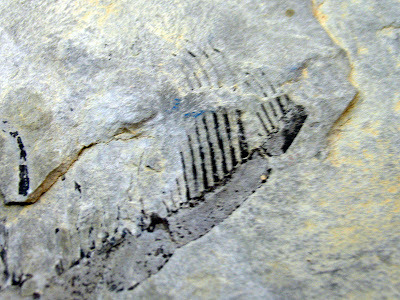 The piece is part of a eurypterid leg from the Upper Ordovician Period and was found near LaGrange, Kentucky. I was not aware that such creatures roamed the ancient seas this close to Louisville, Kentucky. 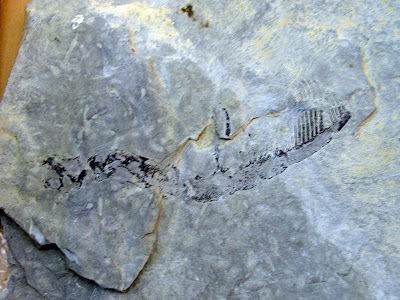 The fossil was found at least 25 years ago and pictures were sent to Dr. Kenneth Caster at the University of Cincinnati at that time. 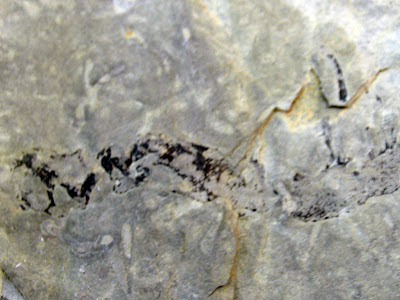 He replied back and noted that it appeared to be a Megalograptus ohioensis. He also said that it was only the 2nd record of that genus in the Cincinnatian Series. Dr. Caster also put this in his correspondence: "I suspect that the seemingly single series of comb-like spines on the distal portion is preservational in all likelihood: only the series of articulated spines on one side being preserved." So if you are hunting the Ordovician Period fossil road cuts in this area, be on the look out for pieces like this.